(North Bergen—November 8, 2015) Dr. Laje Gashi’s sophomore French classes at High Tech High School scrambled around the Resource Center of the North Hudson Center, adding finishing touches to their black, white, and red-decorated 2015 Café Classiquebanner, which would beckon guests who would also be greeted by the tantalizing aroma of freshly-baked crêpes, the twinkling of fairy lights, and French music serenading the ears, announced Dr. Joseph Giammarella, Principal of High Tech High School. Although initially anxious to see how the staff, teachers, and students would take to the 2015 Café Classique, the thirty students from the Class of 2018 came away wholly satisfied. In addition to selling freshly-baked crêpes, the Café Classique sold other desserts and dishes, from chocolate mousse served with whipped cream and mint leaves to croque monsieur straight from the press to sparkling cider. The managers of the Café Classiquetreated guests to a photo booth, where they had the opportunity to pose in front of a background of the Eiffel Tower, Le Louvre, or the River Seine for posterity. 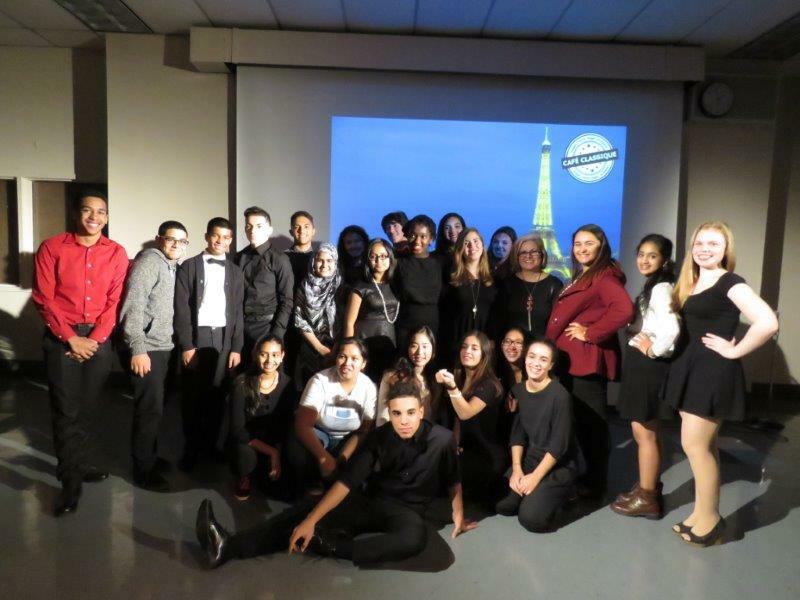 Dressed in formal black and white apparel, the Class of 2018 served French cuisine to passersby, even performing songs by famous performers like Belgian singer Stromae and French cabaret siren Edith Piaf. By the end of Café Classique, the thirty sophomores from Dr. Gashi’s French classes raised over $783, enough to treat them to an authentic French restaurant in the springtime.